I have been meaning to try a couple of Julep's nail colors and beauty products for quite some time, so when I saw that Julep had a summertime mystery box up for grabs a couple weeks ago, I immediately caved! Every so often Julep offers "Mystery Boxes" which contain $70-$200 worth of product, for a crazy good value. There were three variations of mystery boxes this time around, all with a summertime theme-summer days ($24.95), summer nights ($24.95), and a box that contained a little bit of both day and night ($39.95). Also, each of the boxes included two new and exclusive nail shades. There is something about a warm, crisp summer evening that I just love, so of course I had to go with the summer nights mystery box. I got my box the other day-loved the very speedy shipping/delivery, and I received a beautiful assortment of nail colors, a lip gloss, and a sample sized packet of Julep's glycolic hand scrub. Kyla: Orange with multidimensional glitters. This was one of the two nail color exclusives in the box. Kyla is a gorgeous heavily saturated glitter. The sparkles are super pretty and dazzling. Two coats will do it for a lovely, opaque result. Monica: Hot pink with multidimensional glitters. This was the other exclusive nail color. Like Kyla, Monica is also an opaque glitter, with just two coats needed for full-on coverage. I love pinks for the summertime, and the glitters which sparkle shades of violet, red, teal and gold, add a really fun kick to the nails. Char: Navy blue crème. Deep navy blues are one of my favorite colors to sport on the nails. To me, Char definitely gives off a summer night feel, and it's undoubtedly going to be an amazing shade for the coming fall/winter months as well. Char's formula is pretty thick, and I found one thick coat to be sufficient enough for an opaque and smooth coverage. But if two coats is more your thing, I suggest going thinner on them for the most even looking results. Billie Jean: Fuchsia crème. My pictures couldn't quite translate the dominant purple tone in this shade, but it is very apparent when seen in person. Billie Jean does contain a thick formula, but it isn't heavy like Char's consistency is. It certainly has more give to it. I did achieve opaque coverage with one coat, but the addition of a second one was essential to eliminate and smooth out the unevenness and patchiness, which this nail color is prone to. This dried to a semi-matte finish, so if you want some added glossiness a shiny top coat should do the trick. 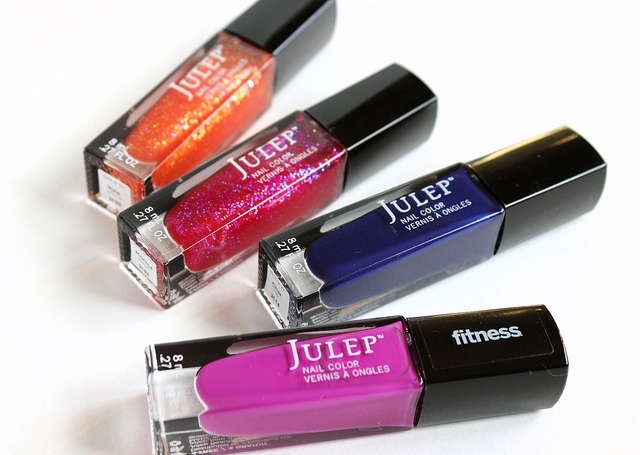 Julep's nail colors don't contain formaldehyde, formaldehyde resin, DBP, or toluene. I am quite fond of these Julep nail colors, for the most part. Yes, the formulas are on the thicker side, but they can totally be worked with as long as you have the right application method down. I really like the look of the nail polish bottles. They are very sleek, and their long and thin shape makes them great space-savers. The nail brush is pretty nice. The shape of it is just perfect for my wide nail beds, and it really makes application that much easier. I will say that the brush does have the tendency to load on a lot of polish. So make sure to swipe off the excess before you start application, to avoid color pooling on the nails (I learned the hard way). I haven't tested all of the shades for wear time, but Char has been my mani color for three days now, and I am very impressed at how well it is holding up with a top coat. There is not a chip in sight, only some tip wear. Oh, I also wanted to mention that the two glitters-Kyla and Monica, aren't of the stubborn kind. We all know that most glitters are usually a challenge when it comes to removal, but these two are amazingly easy to remove-no special removal method required! The Zinnia lip vernis is a gorgeous plum with silver shimmers throughout. This paraben and sulfate free gloss is actually one of the smoothest I have come across in awhile. It's very creamy, and it doesn't leave behind a tacky feeling. It feels really comfortable and lightweight on the lips. 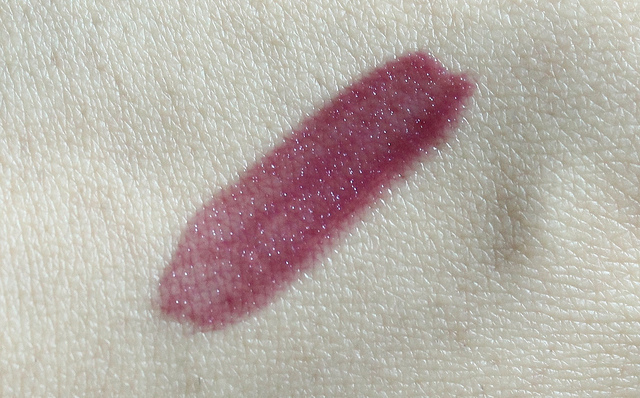 This lip vernis imparts a pretty plum tint to the lips, without the shimmers being overbearing. When it comes to lasting power, I can get about 2-3 hours of wear time with this gloss, before it begins to fade. I tend to reserve shades like this one for the fall/winter season, when deeper lip colors are a frequent occurrence in my routine. This gloss is going to look just beautiful layered over a berry/plum lipstick. I tried the Glycolic Hand Scrub and I really enjoyed it. My hands felt super soft afterwards, and the light floral fragrance that lingered was lovely. My hands get very dry during the colder months, and a product like this is just what I need to instantly soften them up. I may just have to buy the full size of this hand scrub. Overall: I really liked trying all of the items I received in the Julep Summer Nights Mystery Box. I don't know if I am going to sign up for a monthly Julep subscription just yet, but in the meantime, I will be checking out more of Julep's mystery boxes. I think mystery boxes are super fun, and they are a great way to try a few of Julep's items. 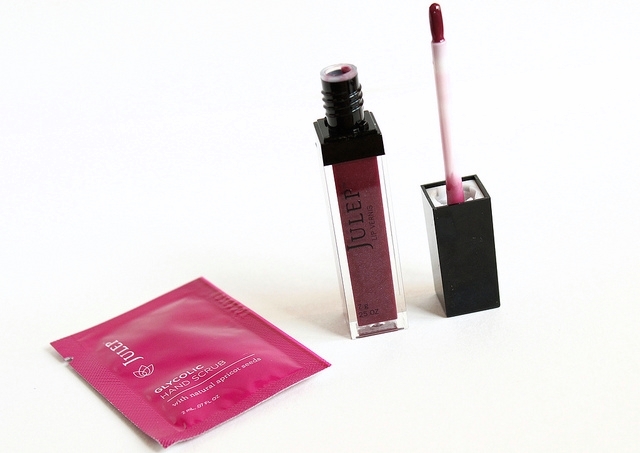 Which are your favorite Julep products? Have you tried Julep Mystery Boxes?